My only criticism of your line of argument is your view of Reagan. Undoubtedly, he was a prime example of the sort of limited-government, pragmatic, grown-up conservatism you advocate; but I think it's scarcely deniable that the Christian right first became active politically under him. Indeed, their efforts contributed to Reagan's election success, and their support did find in-roads into his policy (his neglect of the AIDS epidemic, for example). In many ways Reagan is very far from Burkean and Oakeshottian conservatism - far away from Goldwater, even - not the least in his appeasement and empowerment of Christian fundamentalists, making them into a political force for the first time in American history, etc. And something tells me that Burke wouldn't have endorsed Reagan's particular brand of Cold War conservatism; I mean, I'd like to think that Edmund Burke would have lambasted Iran-Contra, not cheered it on. 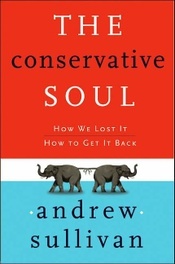 As Conor Cruise O'Brien states in his great "thematic biography" of Burke - conservatism as a synthesis of evangelical Christianity, military patriotism, and unchecked free-market values is something Burke would hardly have endorsed. Reagan did indeed presage some of the worst aspects of today's degenerate Republicanism. His deficit spending, his subversion of constitutionalism in Iran-Contra, his coded appeal to Southern bigotry when beginning his campaign, and his dithering on the HIV epidemic are all fore-runners of later abuse. But they were mild in comparison to Bush. Reagan would never have signed the biggest increase in entitlement spending since LBJ; Reagan's domestic spending record was far better than Bush's; Reagan raised taxes when he felt it necessary; he reformed the tax system in his second term; he vetoed pork; his Supreme Court nominees were diverse; he would never have gone to war in the reckless, unplanned way the Bush administration did in Iraq; and his foreign policy was a blend of deep conviction but also pragmatism, as he reached out to an imploding Soviet Union in his final years. Even on Iran-Contra, he eventually fessed up, and apologized. You can see the seeds of future conservative self-destruction and hubris, but Reagan's record, to my mind, is on balance, a conservative one in the best sense. His undoing of excessive government control of the economy and his defeat of the Soviet Union dwarf everything else.